Fourth Row Center: Film Writings by Jason Bailey: On DVD: "Shutter Island"
Martin Scorsese's Shutter Island opens with a shot of a ferry boat emerging from a thick, soupy Massachusetts fog, emerging from the dense haze like Lawrence materializing from the horizon. As with much of his best work, Scorsese's latest is imbued with his lust for film; he gets drunk off movies, then sits us down and pours us a shot. That kicky energy disappeared for the first half of the previous decade, as he made well-crafted entertainments like Gangs of New York and The Aviator that threatened a metamorphosis into a respectable classicist in the order of his heroes Powell and Pressburger. Then came The Departed, a crackerjack thriller filled with shocking jolts and dirty jokes, a reminder of how much fun we could have a well-made pop picture. Shutter Island does not top that film, and doesn't seem to want to. It's Scorsese having a go at genre filmmaking, adapting Dennis Lahane's novel into a jittery suspense flick with some grimy Freudian twists. The time is 1954, and Leonard DiCaprio (making his fourth consecutive appearance in a Scorsese picture) plays Teddy Daniels, a U.S. marshal sent to the titular isle, which houses a chillingly atmospheric hospital for the criminally insane. As the ferry floats in, they're told that the dock is "the only way on... or off," and you can almost hear Scorsese cackling off-screen. Some filmmakers wait their whole careers for an excuse to use a line like that. Teddy is joined by a new partner, Chuck Aule (Mark Ruffalo); they're on the island to investigate the mysterious disappearance of a female patient (Emily Mortimer), who seems to have improbably vanished into thin air. 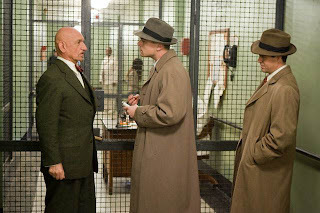 Compounding the befuddling circumstances of her escape is the institution's refusal to provide much of anything in the way of assistance or information, and the institution's guru, Dr. Cawley (Ben Kingsley) is particularly obstructive. But he's not the only one hiding things--we slowly realize that our hero is more than a little troubled, and that he may not have landed on the island altogether accidentally. On their way in to the facility, Teddy grimaces at the rules and regulations and jokes, "You act like insanity is catching." Boy, is it ever. More than that I will not say; one of the pleasures of Laeta Kalogridis' screenplay is how slowly it peels away the considerable information within, but keeps us off our footing anyway. Kingsley's Dr. Cawley says so much, but reveals tantalizingly little, and the script functions in much the same fashion, looking us straight in the eye while tossing disturbing visual motifs into our peripheral vision. It's one of Scorsese's best-looking films, full of vivid, arresting dream imagery and tightly coiled, blood-splashed compositions, lit hot from the top by the great Robert Richardson and assembled with snappy zeal by his brilliant editor Thelma Schoonmaker. The filmmaker does some of his most purely visual storytelling here, particularly in the cutaways and head trips that propel the story forward and push it into quiet surrealism. The ads are pushing the horror elements, and that's probably wise promotion but not the most accurate representation of the finished product--it's a talkier film than you might think, and there's not a lot in the way of big scares. But it does have a nice, dread-soaked feel, and one long sequence (Teddy working his way through a box of matches as he slips through the creepy "Ward C") that crawls around under your skin for a while. DiCaprio does the weathered, trouble hero well here, while Ruffalo is a reliable sidekick and Kingsley and Max von Sydow are ominously appropriate villains. Patricia Clarkson and Ted Levine contribute fine character turns, but Shutter Island really is the director's show, and while he's clearly having a good time (his roving camera has as many spins and twists as the story), it isn't quite as sharp as you walk in hoping it will be. In the Scorsese canon, it operates at about Cape Fear level, and that's still pretty damn good--sometimes his films transcend their B-movie roots (resulting in something more than a gangster film, more than a cop movie, more than a boxing picture), and sometimes they don't, but hey, there's still some terrific moments and grin-worthy shout-outs to Shock Corridor and Val Lewton. Yes, there are scenes he doesn't bring off and beats he lets run on for too long. But it's all so compelling and exquisitely told, and Scorsese, more than any other filmmaker working today, knows how to put an audience right into the palm of his hand. And that third act is pure dynamite. "Shutter Island" hits DVD and Blu-ray on Tuesday, June 8th.